The Radio Server from Olympus has a 37GB hard drive. It's debatable whether equipping a standard AM/FM radio with a hard drive and the ability to record broadcasts is particularly useful in the era of internet radio, but there's no denying the new VJ-10 Radio Server from Olympus Japan is a smart little piece of kit. 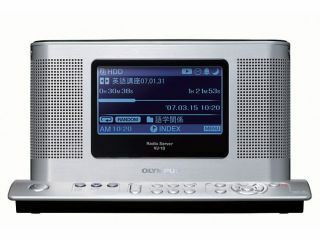 The pumped-up clock radio goes on sale in Japan in the middle of March for ¥40,000 (£170) and has a stupendously large 37GB internal hard drive (it's probably a 40GB notebook drive, but Olympus hasn't specified), to which 2,500 hours of recordings can be committed. A 3.9-inch LCD helps navigate stored music and on-air stations. While it's highly unlikely anyone will want to listen to more than about five minutes of the appalling drivel that passes for broadcast radio here, there are other uses for the VJ-10, as it can connect to a PC via USB. Once hooked up, it's a drag-and-drop affair to load the player up with either WMA or MP3 audio files. Recording, incidentally, is only in variable bit-rate WMA. As if all that aural pleasure weren't enough, Japanese language fans might want to wait until April to get hold of a special-edition VJ-10 that comes pre-loaded with six months' worth of NHK radio English lessons for ¥45,000 (£191).